Sakura sees a winged serpent beast attacking the city. Her new key is pulled to the creature, taking her with it. On the horn of the beast is the figure whom Sakura has previously seen in her dreams. The key is being taken away from her, so she angrily demands the other party stop it. Sakura awakens from her nightmare to a concerned Kero-chan. She has the key from her dream and doesn’t understand. At breakfast, her father senses something is wrong, but Sakura smiles and plays it off. When Sakura leaves for school, the ghost of her mom (Nadeshiko-san) appears to Sakura’s dad. On the way to school, Sakura and Kero-chan are under attack from a mysterious wind. Sakura can’t use her cards since they are transparent with nothing on them. Her key activates and provides a shield. Sakura tests a theory and it pays off as she causes the key to become a new star wand. 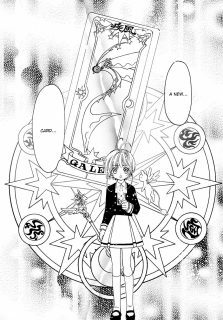 Sakura comes up with an incantation and turns the wind into a transparent card called Gale. Sakura shows the new card to Tomoyo-chyan and Syaoran at school. While the card is transparent, turning it at angles causes the Gale image to turn into the pattern similar to the one on the back of her former cards. She shows the new key to Syaoran, who only senses Sakura’s magic in it. Sakura doesn’t know what to make of these things, but she wants to talk about it more later. After she and Tomoyo leave, Syaoran gets a call from Erio. 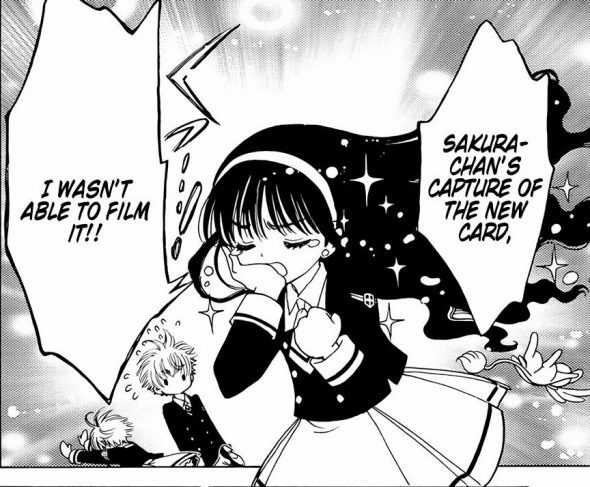 Syaoran reports that Sakura got a new card and that he understands what he has to do. Hmmm. 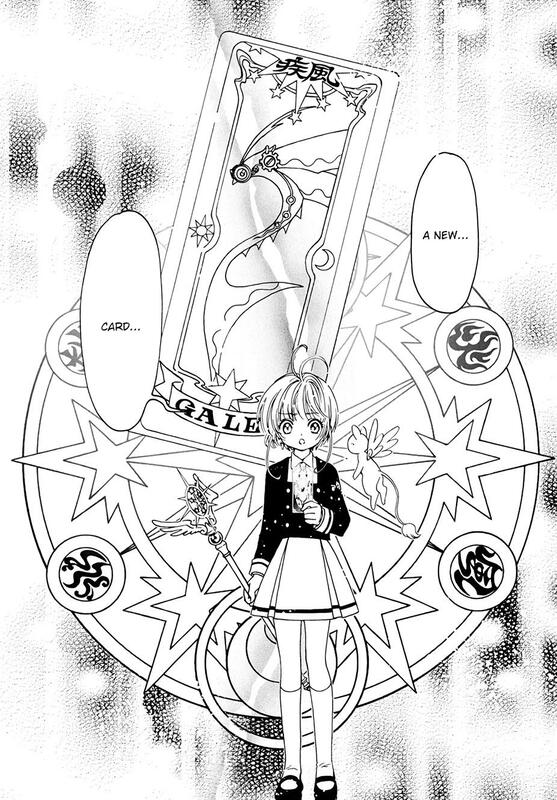 Well, this chapter pretty much confirms it — the return of the Cardcaptor is just that — the return of the Cardcaptor. I guess my concern is that Cardcaptor Sakura: Clear Card Arc is just going to be a rehash of Cardcaptor Sakura. Already, Eriol appears that he may be taking up his same role from CCS in driving Sakura into doing things for her own good. Syaoran’s constant look of concern becomes understandable if Eriol is using him to screw with Sakura. If this is the case, I’ve love for Syaoran to lay the smack down on Eriol for doing what he’s doing. That aside, Sakura’s vision of the winged serpent could be a sign of something that’s coming. That would follow the pattern established by Cardcaptor Sakura. Sakura’s capture of the new Gale card was rather anti-climactic. I think it was less climactic than when she captured Windy back in the day. I’m of two minds here. On one hand, I do like that Sakura is showing her experience in capturing this new card. On the other, the “been there, done that” further helps kill things. Tomoyo-chan pretty much steals the chapter though. Not only that, she does it in a single page, lamenting the missed opportunity to witness Sakura capturing a new card and NOT getting to wear a new outfit in the process. Finally, Sakura’s ghost/angel mother returns. It would be nice if she had more of a role than just silently appearing from time to time. In the end, Cardcaptor Sakura Clear Card Arc 03 is an OK chapter for what it is. I’m just concerned that CLAMP are just going to tread the same path they did in the original Cardcaptor Sakura. Mmmm… I just hope CLAMP don’t complicate things unnecessarily. Because that is what they did with Tsubasa Reservoir Chronicles, and it was a mess at the end (didn’t read xxxholic because of that). So keeping it simple is good to me. As this manga wants to celebrate the 20th anniversary of the original story, rehashing the initial setup can work ok as a start. And yeah. Tomoyo is the best character. Yeah, xxxHOLiC was good until the Tsubasa crap corrupted it. Yes, it is a rehash, but at the same time it feels like CLAMP getting more in touch with their older storytelling techniques before they became the “convoluted stoy/hiatus queens”. – Why do we have new cards and what does this mean in terms of Sakura’s powers developing? The fact that we get this series on a monthly basis makes me jonesing for the next chapter. The only things I can hope is that they follow this story through since this feels like a return to old school CLAMP (in terms of storytelling). But in all seriousness, I agree with you that I hope they don’t return to convoluted stories and such. I need to go back and reread the original manga. I don’t remember him getting anything. The only things I can hope is that they follow this story through since this feels like a return to old school CLAMP (in terms of storytelling). I think the caped figure is Sakura (future self) coming back to force Sakura to update all her cards to a higher power. The caped figure has the same 6-pointed star as the new star wand, is Sakura’s height, and plus only Sakura’s power is sensed by all. I called it first!